The Quarterly summarizes the best available research evidence on children's mental health prevention and treatment interventions — for practitioners, policymakers, parents and members of the public. The Quarterly provides summaries of the best available research evidence on a variety of children’s mental health topics, prepared using systematic review and synthesis methods adapted from the Cochrane Collaboration and Evidence-Based Mental Health. Our goal is to improve outcomes for children by informing policy and practice. 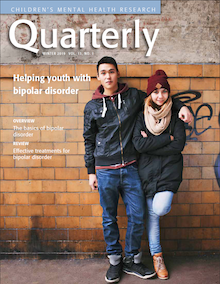 The BC Ministry of Children and Family Development funds the Quarterly. 2016: What are evidence-based approaches and why use them in children’s mental health? NEW! Subject index to the Children’s Mental Health Research Quarterly . Also check out our new executive summaries. 3 - How can foster care help vulnerable children?